In earlier years, Oxford did not have an organized fire department, though the village appeared to have some structure of fire protection as early as 1934. Village record keeping was sketchy at best and did not go into great detail. Prior to 1934, there is no record of any fire service. The first equipment was a chemical fire fighting apparatus that was probably towed or pulled to fires on some kind of wagon or cart. This original chemical unit was found years later in a basement, and has been returned to the fire department for historical value. The first mention of any attempt to organize fire fighting in the village was in April of 1939 when the village board formed a fire regulation committee that consisted of Maurice Treadway, Ed Fabert and Ben Nelson. The following dates and comments come from village and fire department records. March 3, 1941 – Motion was passed to have the fire committee investigate what could be bought in the line of a truck for mounting the chemical fire apparatus. Jan. 5, 1942 – Motion was passed to pay to the order of W.L. Wohlfert as a down payment on the fire truck purchased for $150.00 and the balance payable in twelve months with the interest rate of 5% from the People’s Bank. July 5, 1942 – Motion passed that the village purchase a siren for the fire department for any purpose that the village sees fit. Nov. 2, 1942 – Motion passed that anyone convicted of tampering with or molesting any property in or about the fire building will be fined $100.00. Dec. 7, 1942 – Motion passed to pay 25 cents per day for keeping a fire in the stove in the fire building. Ben Nelson was given charge of securing help to do this. Sept. 7, 1943 – Motion passed that the fire truck may be called within a 3 mile radius of the village during the months of May, June, July, August, September, October and November and that during the months of December, January, February, March and April the truck is not to be taken outside of the village limits. The charge for fire calls will be $25.00 for the first hour and $15.00 per hour thereafter. Oct. 4, 1943 – A building fund was started for a community hall/fire station, with $500.00 being set aside. Oct. 12, 1944 – The village board purchased 2 lots from the Civic Club on Franklin Avenue for $25.00 with the stipulation that a library be included in the new building. April 9, 1945 – A motion was passed that the fire committee be authorized to sell the chemical fire trailer. Sept. 3, 1945 – A motion was passed that Asa Vanderbuilt be paid $10.00 per year for sounding the siren for fires, at noon, and for curfews. June 4, 1946 – A motion was passed that George MacKenzie be appointed Fire Chief with the purpose of organizing a fire department in compliance with state fire codes. Oct. 7, 1946 – A motion was passed to purchase a trailer from E. W. Fabert for $200.00 for the purpose of using it for carrying the extra fire hose. Oct. 7, 1948 – A vote was taken for the purchase of the fire truck recommended by the fire committee. Nov. 4, 1948 – Frietag and Sons of Montello were paid $875.00 for a 2 ½ ton truck. This was probably for the GMC front mount pumper. March 3, 1949 – The village board paid Wisconsin Fire Apparatus $2,532.00 for building a fire truck which included extension ladders, a pike pole, lanterns, a hose nozzle, a booster reel with hose, extinguishers and 4 spanner wrenches. Jan. 5, 1950 – The fire committee is authorized to sell the Ford and Oldsmobile fire trucks if they see fit. April 17, 1950 – The fire committee orders the following fire equipment. 200 feet of 1 ½ inch hose at 99 cents per foot. 300 feet of 2 ½ inch hose at $1.60 per foot. March 1, 1951 – The village voted to hire Ray Voboril for a few meetings to organize and instruct volunteers interested in becoming members of a volunteer fire department. April 5, 1952 – The Oldsmobile fire truck was sold for $100.00. While there appear to be no photos of this truck, Endeavor Fire Chief Henry Ellis (now deceased) recalls the day that he saw the truck headed south on Hwy. 51 as it went past Endeavor. He recalls that it was an open cab truck with large wood-spoke tires and a large steering wheel. Nobody recalls where the truck was originally purchased from (Oxford did not buy it new), and it is believed that it was sold to someone from Madison. Henry described the truck as looking like a classic old fire truck. April 19, 1954 – The village board voted to have 5 telephones connected for fire calls at a price not to exceed $420.00. May 6, 1954 – The village board voted to consider a contract with Hubert Treadway for the storage and service of fire equipment in a proposed new building. There is a recollection that on occasion Hubert would take the fire truck and head off to a fire by himself, leaving other volunteers that arrived to have to find out where the fire was, then drive to it themselves. Jan. 1956 – The Oxford Fire Department was officially organized and chartered with the State of Wisconsin. The first Fire Chief was Lester Rodger, with Assistant Chief being Joe Kazsa. Jan. 1957 – Chief Lester Rodger and Assistant Chief Joe Kazsa are sent to Madison to attend the fire institute. Nov. 1957 – A Ford fire engine is purchased for $675.00. This truck had a 1000 gallon water tank and had a portable pump mounted on it. The fire department appeared to be completely up and running in 1957. The following men are listed as some of the members that were paid by the village. Hubert Treadway, Harry Nemitz Sr. Gordon Roos, Joe Kazsa, Henry Phillips, William Procknow, Malcolm Summerton, Wesley Herrick, George MacKenzie, Alfred Sebastiani, Myron Goodhue, Carroll Holliday, Ray Bufton, Chris Meyer, Lester Rodger, Ronald Rodger, Charles Riley, Wayne Goodhue, J.A. Hines and Norman McNutt. March 1959 – A referendum is passed to build a community building and fire station. Jan. 1960 – The fire department enters in to an agreement with the Oxford Lions Club on operating the Oxford Ambulance Service. March 1961 – The village board loaned the Oxford Ambulance Service $1,825.00 to purchase a new ambulance. A van was purchased, complete with a red light, siren and cot, along with cabinets installed in the unit. It was the first ambulance in Marquette County. The Sheriff’s Department purchased station wagons for squad cars that also carried cots and served as ambulances. April 1961 – An agreement is made to furnish fire protection to the Oxford Convalescent Home in the Town of Oxford. May 1961 – Fire fighting uniforms were purchased for $1,300.00. Oct. 1961 – The Fire Chief is authorized to enter in to an agreement with Adams County and Marquette County for fire protection. June 1965 – Fire department by-laws are changed to accept members that live outside of the village limits. Aug. 1965 – A new fire siren is purchased for the fire station. This siren is still in service today, but is no longer used to alert volunteers to emergencies. It is activated occasionally on meeting nights, basically to check to see if it still works. Prior to 1956 when a fire call came in, the siren was sounded by Asa or Grace Vander, who ran the telephone company in Oxford. When the Treadway and Meyer Service Station was built, the fire siren was moved to their building and later moved to the current fire station. It is mentioned earlier that fire phones were purchased. This system was expanded to the homes of as many fire fighters as possible. When a fire call came in, phones in members’ homes would ring continuously to indicate that there was a fire call. Someone was expected to answer the phone and take the information, then blow the siren from a red button that was installed in each phone. The more people that picked up their phones, the more distracting it was. The background noise would include television’s or radio’s, children screaming or crying, dogs barking and even the sound of lawn mowers outside. The more people that picked up their phone, the harder it was to hear what the caller was saying. Often, someone would answer the phone and be taking the information when someone else would pick up the phone and say “Oxford Fire Department”, further confusing the caller as well as everyone else listening in. If you did not have a fire phone, hopefully someone would call you to tell you about the fire, or you could hear the siren and respond to the station. This system was eventually replaced by the purchase of portable pagers that are activated by the Marquette County Sheriff’s Department. The pager system has been upgraded several times and is still used effectively to this day. July 1967 – The fire committee is authorized to purchase a new fire engine. This truck is a front-mount Ford with a 5 speed transmission and a 1000 gallon tank that is designated Engine 155. This is the first new fire engine ever purchased by the department to date. This engine was the front line engine until 1983 when it was replaced by a new Chevrolet fire engine. It then became the second engine out until it was taken out of service around 1995. It was used by the Village of Oxford for a short time before it was sold. In either 1973 or 1974, the Town of Oxford purchased a used Ford mid-ship pumper from the Addison Illinois Fire Department. This purchase was made because the 1948 fire truck had to be taken out of service and the village chose not to replace it. In May of 1975 the fire department purchased it first vehicle that was solely owned by the fire department. A ½ ton Chevrolet 4X4 pickup truck was purchased and converted in to a grass unit. This purchase was the first step of many that eventually led to the fire department going in to agreements with the Town of Jackson, Town of Oxford and Village of Oxford to provide fire protection and to receive all revenues from the fire calls. This was the first truck on the department that was painted a new color known at that time as “lime green”. The other trucks were still painted red (which some believe is the color that fire trucks SHOULD be), but as time went by, additional trucks purchased were in this bright color also. Oxford Fire is the only department in the county with their trucks in this color, so they are easily identified at mutual aid fires. The remaining red truck was Rescue 152, which was purchased used from the Sun Prairie Fire Department. The truck is actually red and white, and the paint was in good shape when the truck was bought, so the decision was made to leave it that color rather than undertake the cost and effort of painting it to match everything else. The end of the "red" era came in 2001 when this truck was replaced by a "lime green" 1993 Spartan rescue truck purchased from the Webster, Texas Fire Department. The second truck that was obtained directly by the department was a used military 2 ½ ton 6X6 truck. This truck was equipped with a water tank, portable pump and a hose reel so that it could be used at wildland and grass fires. The truck was procured through civil defense and was designated truck #150. Through civil defense, a jeep 4X4 and trailer were also received, painted “lime green” and put in to service to be used for grass fires and carry extra equipment. The department then purchased a military ¾ ton 4X4 pickup truck that was outfitted with a small tank, portable pump and hose reel, designated grass #159 and an additional military 6X6 that was outfitted as a tanker and designated Tanker #151. All of these vehicles have since been sold, however, the department did purchase a 1967 military 2 ½ ton 6X6 multi-fuel truck that is currently in use as a grass fire truck and back-up tanker. The truck has a 1000 gallon poly tank, a portable pump and a hose reel, along with a Newton Quick-dump. The truck was put together by members of the department, and while clumsy to drive, it has put out a lot of grass fires. It is designated as grass #150. In 1980, a small step-van was purchased that would be used to carry additional equipment, along with a cascade air system which allowed the department to refill breathing tanks at the fire scene. It was the first portable cascade system in the county and was often called to mutual aid fires to assist in filling air tanks. As larger trucks were purchase with better storage space, the equipment van became obsolete, and took up precious space, so it was sold. Currently, the department has a cascade air system in the station, along with a portable cascade system that is on Rescue 152. In 1981, the used pumper that was purchased from Addison was taken out of service. The two townships and the village went together and bought a used pumper from the Kilbourn Fire Department in December. The small front-mount pumper had an automatic transmission, and while it needed some work, it proved to be a reliable pumper. It was expected that this truck would be used until a new pumper could be purchased. The Wisconsin Dells truck used the body off a 1953 Dodge pumper that they had, which was then installed on a 1968 Chevrolet Chassis. The front mount pump put out 500 gallons of water a minute. When Oxford received their new truck, the Dells truck was sold to the Town of Newton Fire Department and actually served as their front-line pumper for another 27 years, making it one of the oldest front-line pumpers in the state until Newton replaced it in 2010 with the first new engine in the history of their department. It has since been bought back by members of the Kilbourne Fire Department (Wisconsin Dells) with the plans to refurbish it as a parade unit. A committee was formed under the guidance of Chief Earl Jungenberg, and in early 1983, a new custom pumper was purchased from a company in Minnesota. The 5 speed Chevrolet pumper had a 1000 gpm mid-ship pump with a state-of-the-art top-mount control panel, 1000 gallon water tank, a 35 foot extension ladder, a folding roof ladder, pike poles and hard suction. The “pride of the fleet” was designated as Engine 156, stayed in service until 2014. Also in 1983, a 4X4 pickup truck owned by firefighter John Roller was purchased, painted and outfitted as a grass truck to replace the Chevrolet pickup truck that was having many problems. The truck was converted by the firefighters, and remained in service as the primary response grass unit until a new grass truck was purchased in 2006. The old truck was purchased by the Oxford Lumber Yard, and still sports the “lime green” paint, which helps in identifying it as it serves the lumber business in the area. In 1986, the only rescue service in the county was equipment owned by the county, and being handled by the Montello Fire Department. The first ambulance that Oxford had purchased was carrying a small amount of basic rescue equipment, and was paged to accident calls when needed. Montello Fire Department received a small annual stipend from the county to run this service, and they decided that they no longer wanted to mess with it. The decision was made by the members of the Oxford Fire Department to take over rescue responsibilities, and a contract was signed with the county. The van and equipment was outdated, so the members voted to purchase a used rescue truck from the Bartlett/Countryside Fire Department in Bartlett, Illinois. Several members travelled to Bartlett to see the unit, and an agreement was made to purchase it for $20,000.00. In March of 1986, the 1977 Chevrolet rescue truck was picked up and the Oxford Fire Department entered rescue services. The truck had been built by Super Vac, in Colorado, and featured two large banks of lights that were capable of being raised high above the roof of the truck, providing a tremendous amount of light in which ever direction they were needed. The on board generator and lights soon became popular with law enforcement, and Rescue 152 was often called to provide scene lighting at accidents around the county. Eventually, new jaws-of-life, additional tools, rescue ropes and spare fire fighting equipment were added to the truck. The addition of this truck prompted the department to develop strict guidelines and training standards for rescue operations. The number of calls that the department responded to yearly rose sharply, and other departments took note. In the years ahead, Montello Fire, Harris Fire, Neshkoro Fire and Endeavor Fire would all purchase new equipment with the intent of providing rescue services to their areas. While Oxford’s response area shrank each time a new rescue truck was put in service, we still handle a large number of calls. The building of a 4 lane interstate highway, and increased traffic flow on STH 82 still provide more than enough activity to justify maintaining an efficient rescue operation, not to mention the variety of other rescue calls that come in associated with farm accidents, snowmobile accidents, hunting accidents and so on. 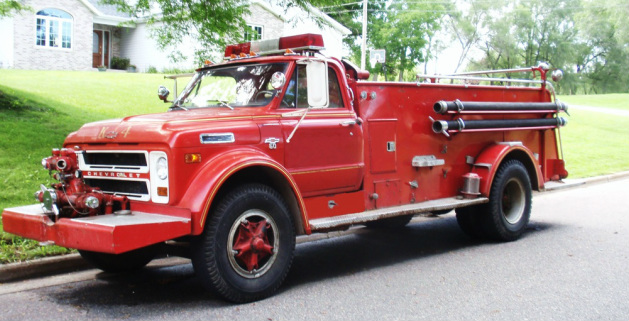 In 1988, A Chevrolet Bison chassis was purchased and a 3000 gallon water tank was added by Welch Fire Equipment. A 3000 gallon portable tank was purchased also for this tanker which replaced a military 6X6 tanker that was designated Tanker 151. In 1994, the Town of Oxford, Town of Jackson, Village of Oxford, and the volunteers all met and agreed, after considerable research, to form the Oxford Fire District. At that time, all equipment that was previously owned by the volunteers was turned over to the fire district. In 1995, a Spartan pumper, built by 3D Fire Apparatus was purchased by the Fire District, and became the first engine on the department that allowed 6 firefighters to ride in a fully enclosed cab. 1998 – A 1967 multi-fuel 6X6 is purchased to replace #150. This truck is still in use for brush fires, and as a back-up tanker. Also in1998 , the department replaced the Chevrolet rescue truck with a used rescue truck purchased from the Sun Prairie Fire Department. This 5 speed Ford, built by Marion, provided much more storage space and allows additional personnel to respond in the back of the unit. Constantly replacing and upgrading rescue equipment has allowed the department to maintain a highly efficient rescue operation. 2001 – New self-contained breathing apparatus and a thermal imaging camera was purchased. 2005 – Stainless Steel & Repair in Marshfield built a 3000 gallon stainless steel elliptical tanker, with 3 remote control dumps, a portable pump and a 3000 gallon portable tank to replace the Bison tanker. 2007 – A new grass truck was custom built by Stainless Steel & Repair to replace old 157. This truck was purchased entirely through a generous donation from a local business, and equipped by money raised by the volunteers. This unit is built on a Ford 4X4 chassis and is equipped with foam capabilities. 2007 – Discussion and research begins in an effort to build a new emergency services building. The current fire station has been changed many times through the years, but the need for more upgrades makes it cost-prohibitive. As the meeting area was shared with the village, fire training meetings sometimes had to be changed or cancelled because other groups were using the room. Because of low ceilings, trucks must be moved outside to be worked on, narrow doors have forced mirrors to be moved in so that they do not get broke off, tires are deflated enough to allow trucks to fit in the station, firefighters cannot get in to all the trucks until they are moved forward, away from walls or other trucks, and in the process, other firefighters are put in jeopardy as they avoid the trucks while they put their gear on. A long list of additional problems made it apparent that the building issue needed attention. A considerable amount of planning and research, along with many public meetings, led to the decision to move forward with a new station. 2008 – Work begins in March on a new fire station that will be located on STH 82, just west of the Village of Oxford past Coddington Hardware. Five acres of land were purchased on the south side of the highway. An irrigation well, already on the site was found to be useable and would be upgraded to allow for faster filling of water tankers. The Fire District decided that they would build 5 drive-through bays, allowing room for equipment to be positioned in such a manner that no trucks would have to be moved to get other vehicles out. EMS would also be included in the building, with an office next to the fire office. A large meeting room, kitchen, two restrooms, storage and equipment maintenance areas as well as adequate parking are all part of a facility that will be used solely for Fire and EMS Services. The contractor anticipates that the station will be ready to move in to around the end of July, 2008. In October of 2011, the District approved the purchase of a "new" rescue truck. While some communities fight buying used equipment, Oxford has always embraced the concept. It allows the District to purchase equipment at a greatly reduced cost, saving the taxpayers a considerable amount of money, and it adds a replacement vehicle that has had "the bugs" worked out. Some departments will argue that buying used equipment is just buying someone elses problems, but Oxford has always found that if you do your research, you can find a fantastic apparatus that will last for years. The current rescue truck is a 1993 Spartan that was used by the Webster Fire Department (a suburb of Houston, Texas). The truck increased our storage capability of rescue equipment, and greatly enhanced our night scene lighting, as well as adding more room for personnel, and a command center located in the cab. After going to Texas to view the truck, Chief Houslet returned with the recommendation that we make an offer. The truck was purchased by district funding and department-raised funding. Total savings to the district taxpayers was over $300,000.00, and the truck has been everything the department hoped for. The old rescue truck was sold to a department in northern Wisconsin, and serves them well. The Oxford Fire Department has grown through the years from basic fire suppression to now also include medical services, rescue and extrication, hazardous materials response as well as specialized services for ice rescue, recreational accidents and other specialized services. Since the formation of our department in 1956 to the present time there have been many men and women responsible for our growth. This growth is made possible by a group working together as a team, not always agreeing, but always getting the job done. We can only hope that in the future years that the members of the Oxford Fire Department don’t sit back and say, “Look what we have done”, but stand up and say, “Look what we are going to do”! The Oxford Fire Department is always seeking pictures, information or stories related to the departments’ history. Research and information for this section was compiled from department and village records, as well as personal recollections of firefighters past and present, and through the efforts of retired member Harry “Sonny” Nemitz and Assistant Chief Steve Klump.